Feng Shui Your Life and become better organized using hypnosis! Get organized and move ahead in life! Hypnosis is all about organization and the removal of clutter. It works at the deepest levels of the subconscious to organize thoughts and allow for a free flow of information. This in turn allows us to overcome bad habits and fears and change the way we respond in certain situations. 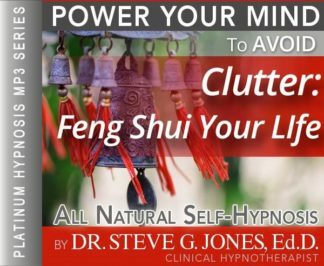 What my Avoid Clutter and Feng Shui Your Life Hypnosis MP3 can do for the mind, it can also do for our external environment by changing a mind-set that leads to clutter and disorganization. Feng Shui is all about how we respond to nature and our environment just like hypnosis affects our responses to situations. That environment may be a room, our entire home, or the office. It is about the relationship between our furnishings and belongings and how they make us feel and act in a certain environment. A good example is seeing a child in a room full of scattered toys. The children will usually play more aggressively and not stay focused on any single toy or task. Organize those toys by type and size and place them in buckets, bins, or on shelves and the entire dynamics of play change. With only one bin removed at a time the open space is better utilized for structured play that is less aggressive. Living in harmony with our surroundings is the premise behind the ancient philosophy of Feng Shui. To do this one must become more organized. There is a calmness that comes from being in an orderly space over a disheveled one. If you are not a naturally neat and organized person this is where hypnosis can help. Hypnosis can first help you relax. It then offers subconscious suggestions that instill a desire to be more organized. As the organization begins, the feelings derived from a Feng Shui way of life begin to perpetuate. Steve G. Jones, Clinical Hypnotherapist, has developed a self hypnosis program to help you accomplish this goal. It is called Avoid Clutter and Feng Shui Your Life Hypnosis MP3 session. It can help you be more organization and closer to achieving Feng Shui. To create more harmony in your life you may want to consider a Feng Shui environment. It may sound like a good idea, but achieving such balance is not easy and may not come naturally. Hypnosis is a tool to creating a mindset for what feels right as it relates to Feng Shui. It will help you develop a sense of when it feels harmonious, right or complete. Feng Shui has its origins in Chinese history dating back more than 3,000 years. It is a term used to describe a way of laying out cities, towns, villages, and then ultimately dwellings and rooms within those buildings. It focuses on harmony and order. A Feng Shui environment is intended to be peaceful and allow for tranquility and organization of one’s mind by the way physical things are arranged. Hypnosis creates a similar organization and sense of peace and harmony within one’s own mind. Hypnosis can help you develop an arrangement of thoughts, memories and ideas that will create Feng Shui in your interactions with others and in the way you go about your day. You may find it translates into a desire to create a physical Feng Shui in your own environments at home and at the office. By relaxing the mind and body, Clinical Hypnotherapist, Steve G. Jones, opens the door to creating internal and external Feng Shui. His program called, “Feng Shui Your Life” will benefit anyone desiring a greater sense of inner organization to replace turmoil or stress that is currently ruling their thoughts and actions. Hypnosis is an effective tool to achieving genuine Feng Shui by either ancient or modern definition. Remove Clutter and Feng Shui your Life Using Hypnosis!!! Steve G. Jones, Ed.D., Clinical Hypnotherapist, charges $1,500 for a custom recording and $25,000 for a one-hour private hypnotherapy session at his office. But you can get all the benefits for this low price. 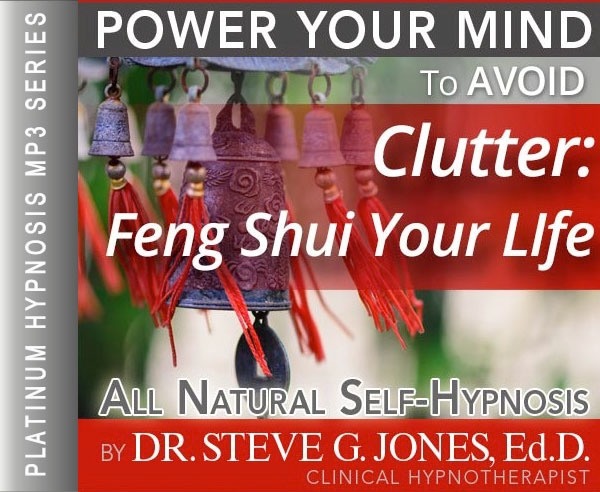 Simply listen to the Avoid Clutter and Feng Shui Your Life Hypnosis MP3 audio every night as you go to bed for three weeks and feel the changes happening in your life. You will feel more empowered, more in touch with your true self, and you will truly know that your goals are within your reach. Feng Shui (pronounced: FUNG SHWAY) was founded thousands of years ago in what is now present day China. The people who practiced Feng Shui long ago looked toward the land, air, and water to see where the best place for survival was. Their crops were dependent on these forces and the people sought after ideal conditions. There are many different techniques used in modern day Feng Shui. A common technique used today is using the bagua. The bagua map is used to coordinate a room or place in relation to ones life. Feng Shui supports the belief of using the laws of heaven and earth to achieve life goals by utilizing positive energy. The idea of Feng Shui dates back to many thousands of years ago and is quite fascinating. If you are interested in learning more about Feng Shui and perhaps use what you learn to apply to your own life, then I encourage you to learn more about Feng Shui! And as you continue relaxing deeper and deeper and more deeply relaxed, you realize just how powerful your mind is, how powerful your mind is. Your mind has the ability to control the energy flow in your life. And you strongly desire to have a proper flow of chi energy in your life. And so you organize your time and you organize the various spaces in your life so that chi can flow properly. You find yourself very interested in organizing your life in accordance with the rules of feng shui so that you can have energy flow and abundance in your life, so that you can have wealth, a wonderful relationship and all the wonderful things that feng shui encompasses. You are very interested in having a life that is very meaningful and has a proper flow. And now you relax more and more deeply. You relax more and more deeply as you think about all the areas in your life that could be enhanced by allowing yourself to feng shui, to properly organize your life. Put energy now in the fame and reputation area of your life, the fame and reputation area. And that part of the bogwa that corresponds to love and marriage, feel yourself putting energy into it now, that part of your life that pertains to children and creativity, that’s right. Giving that part of your life and that corresponding space in your life, energy. And that part of your life that is in charge of helping people, give it energy now. That part of your life that is in charge of career. Then that part of your life that is in charge of knowledge. See yourself energizing those spaces in your life and that part of your mind. And now giving energy to the family and health portion of the bagua. As you feel it’s energy move into your life. And now giving energy to the wealth and prosperity areas of your life and feel now all eight areas of the bagua working together in perfect harmony, because you have organized these spaces in your life and the way you think about your possibilities and you allow a clear flow of chi in your life. So relax now and realize just how powerful you are. Feng shui is all about energy and flow. This powerful self-hypnosis recording will encourage you to organize your life using feng shui. Feng shui allows you to find the perfect spot both in location and time. Feng shui will help you live a prosperous and healthy life. Feng shui has been around for more than 3,500 years. If you are looking for a purchase that will help your maximize the flow of your chi (energy) in all aspects of your life, then you do not need to look any further. This Feng Shui self-hypnosis recording helps you block out negative energy and helps you let positive energy in. The self-hypnosis recording, Avoid Clutter and Feng Shui Your Life Hypnosis MP3 download will help you organize not only things, but ALL aspects of your life. Your energy flow is very important. This hypnotherapy session will help you tune into both the heavens and the earth. If energy flow and organization is what you are after, then this Feng Shui hypnosis MP3 will help you organize your life.